Complete coverage of the shootings across Paris, Europe’s worst terrorist attack in 11 years.A witness captured riveting video of terrorists shooting at fleeing concertgoers at the Bacalat concert hall in Paris on Friday, Nov. 13. Gunshots and screams can be heard inside the theater. 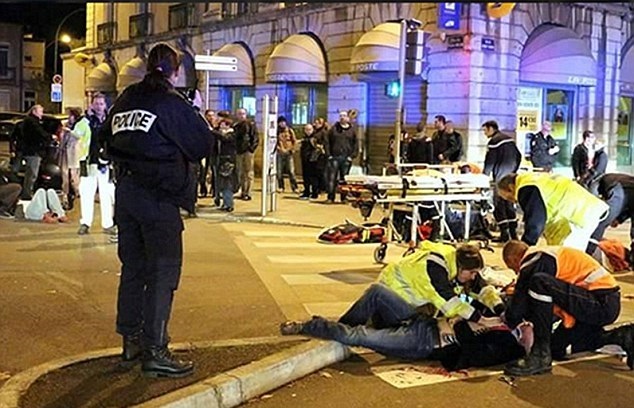 Parisians are seen dragging the wounded down the street, while others escape the carnage by climbing out windows. A terrified pregnant woman trying to flee the Paris bloodbath hung from a window ledge high above the ground, pleading for help. The unidentified mum-to-be was one of hundreds in the Bataclan theatre as the slaughter took place on Friday night.